DID YOU KNOW Using Castor Oil for hair care is one of the oldest known beauty treatments and dates back to ancient Egyptian times. The oil contains a wide variety of minerals and fatty which are essential for maintaining strong hair and healthy skin. 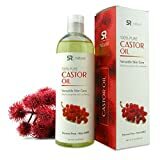 Castor oil also has antibacterial and antiviral properties and one of its main constituents - ricinoleic acid - is a powerful anti-fungal agent. 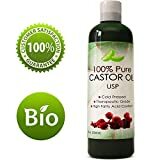 How to use for Skin and Hair Care ? MOISTURIZER: Apply 2-3 drops to fingers or cotton ball. Rinse with water. Pat a few more drops for lasting moisture. Castor Oil is rich in fatty acids which can be easily absorbed into the skin helping to remove dry patches. ? MINOR IRRITATIONS: Dip a wad of cotton in Castor oil and apply directly to infected area. Reapply frequently throughout the day. The anti-inflammatory and anti-bacterial properties may help treat rashes, itches and bug bites. It also helps soothe skin in case of sunburn . ? HAIR CARE : After shower or bath massage a few drops in scalp to help lock in moisture and relieve dryness. Castor Oil contains a wide variety of minerals and fatty acids essential for healthy hair. A FAMILY TRUSTED COMPANY FOR OVER 30 YEARSSports Research (SR®) is a Family Run Company dedicated to providing the highest quality health and wellness products that complement your lifestyle and enhance your well-being. SR natural products are made from pure, nourishing botanicals specifically designed to rejuvenate, restore and improve the overall look and feel of your skin.